Refrigeration, humidification and purification 4-in-1 portable cooler fan built in evaporative water filter, makes the warm and dirty air be cool,clean and comfortable around your personal area. It is much cooler than desktop fan, more humid and energy efficient than air conditioner. The mini desktop cooler will be your ideal partner in this summer. ✓ Adjustable Blade---The wind outlet blade can be adjusted, move up and down 90 degree like air conditioner. ✓ 3 Set Of Fan Speed---The fan speed have 3 options to fit your need when you are sleeping, working or doing outside sports. ✓ Power Via USB----Powered by USB cable to compatible with computers, laptops, portable chargers and other devices with USB output. ✓Up to 8 hours per filling---Maximum 300ml water of the tank can be used for around 8 hours in highest shift. Quiet operation! ✓Add Ice Water And Fragrance---You can pour the water in the tank, even ice which could make cooler wind. Maximum 300ml water of the tank can be used for around 8 hours in highest shift.Add a drop of essential oil, smell pleasant! ★ 4-In-1 Fuction: Combining functions of cooling fan, humidifier, air purifier, and 7 colors smoothing night light in one, this air conditioner fan helps you to create a personal comfort zone, save money for buying all devices separately, also keep your house away from the mess of being filled with those items. 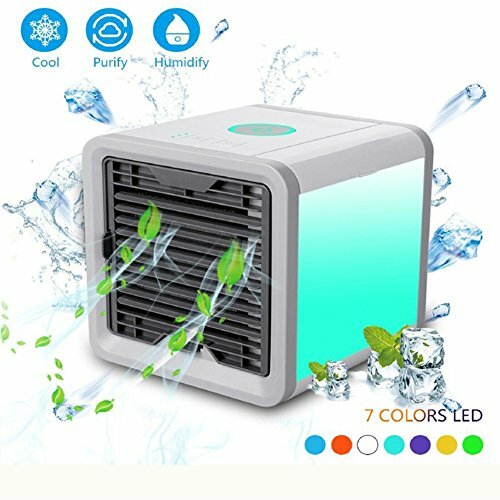 ★ Ultra Portable Lightweight Design: Air conditioner is designed with a ULTRA PORTABLE LIGHTWEIGHT size: 6.5"X 6.5"X 6.7"(2.9lb), making your personal air conditioner come true. This air cooler is Super Easy to Carry or Move, USB charging or AC current supply; Built-in water tank can up to 8 hours when full, which is convenient to take it anywhere, even outside when your family go for an vacation, camping. ★ BUILT-IN 7 COLORS LED MOOD LIGHT: Air cooler fan has 7 different LED colors option, choosing your favourite one can help with the better sleep, can be used as a soothing night light too. Desktop cooler also can be set to color-cycle mode or turned off with the touch of a button. Easy to operate, simply fill with water, plug it into USB port or power bank and the three-speed fan will start blowing. ★ EASY TO USE: It only requires everyday cold water and no Freon need. Simply add water into the tank(300ml, works up to 8 hours per fill)and press the middle button to power on. Left button for adjusting speed from low to medium and high, and the right button for setting smoothing light color. ★ Energy Saving & Non-Freon: This cooler fan consumes only 10W of electricity! Non-Freon! Energy Efficient & Eco-friendly! Premium ABS material, it is higher Hardness, Non-toxic, no smell. Very great for the elderly, adult, child, etc. If you have any questions about this product by KIBER, contact us by completing and submitting the form below. If you are looking for a specif part number, please include it with your message.